Dollars are tight - we know that. But giving up birdfeeding is something we're just not willing to do! Not with all that the birds add to our life! Whether we're enduring the shortest of winter days or the sweltering summer heat, birds add color and sound and life to our lives and to our yards. In our Birdfeeding on a Budget segment, I'll provide hints on how to be able to continue feeding the birds in this tough economy. I'll help you make smart decisions so you can continue to feed the birds. Note that I said SMART decisions, not necessarily CHEAP decisions, since cheap decisions can sometimes cost us more in the long run, and that just doesn't make sense. Let's Feed the Birds! 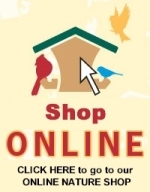 One of the best ways to host the birds on a budget is to take care of the hobby products you already have. That is why we recommend that you store your clay birdbaths if you live in an area where freezes occur. Clay is a porous material and can absorb moisture. When temperatures are below freezing, that moisture also freezes and expands and will likely crack the surrounding clay. While some folks have had luck just turning the bowl over, we recommend bringing the entire birdbath in for the season. Replace it with a heated birdbath if you have one. Hummingbird and oriole nectar can be made quickly at home with two simple ingredients every kitchen has: white granulated sugar and water. Birdfeeding hobby stores like ours sell boxes of sugar to make into nectar and we even sell pre-made nectar, but you can save money by just making your own. Making your own nectar also removes the temptation to purchase RED nectar, which is not needed to attract hummingbirds and could very well be detrimental to birds. The ratio to make hummingbird nectar is 1 part sugar to 4 parts water. Warm the water in the microwave (it doesn't need to boil - just warm enough to dissolve the sugar). Stir in sugar to dissolve. The ratio to make oriole nectar is 1 part sugar to 8 parts water. 1) Start with a batch of hummingbird nectar from recipe above. 2) Double-up on the water only. Store prepared nectar in the refrigerator for up to 2 weeks. 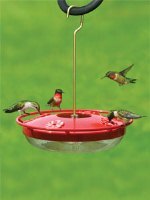 Change nectar and clean feeders every 4-5 days whether the nectar is being consumed or not. Change nectar and disinfect feeder immediately if you see black spots in the feeder. Change nectar immediately if you see cloudiness in the nectar. Birdfeeding on a Budget is a new feature on The Zen Birdfeeder blog. I'll provide hints on how to be able to continue feeding the birds in this tough economy. I'll help you make smart decisions so you can continue to feed the birds. Note that I said SMART decisions, not necessarily CHEAP decisions, since cheap decisions can sometimes cost us more in the long run, and that just doesn't make sense. When European Starlings come to your feeders, they can come in large groups and consume A LOT of food. They crowd your feeders and keep away the birds you really want to see. Here's how to minimize starlings and starling food consumption. Starlings don't care for safflower seed. Most song birds enjoy safflower, though it may take them a little time to get used to it. Just be patient! At my house, it is the preferred food of Purple Finches, and cardinals, chickadees, nuthatches, titmice, and grosbeaks all readily eat it. Serve it straight up (not in a blend) in tube feeders, hopper feeders, or open trays. Added bonus: squirrels, grackles, crows, and jays don't typically care for safflower either! Starlings cannot cling upside down at suet feeders like many of our suet-loving birds can. So serve your suet upside down! While chickadees, titmice, woodpeckers, nuthatches, and wrens will all cling to an upside-down feeder to eat high-fat suet, starlings just can't physically do it. Woodpeckers can cling upside down to access suet at this upside-down suet feeder. There are specialty suet feeders that hold suet cakes in an upside-down position. Leave the suet cake in the plastic tub to keep the feeder cleaner. At a minimum, buy a specialty "Starling Stumper" chain for your existing suet cage that hangs the cage flat. Keep the suet cake in the plastic tub with the open side facing downward and the starlings won't be able to cling to the underneath surface. "Starling Stumpers" are available at your local WBU shop. These two tips will slow down seed and suet consumption by starlings, our first way to be dollar-smart about feeding the birds!